Whether you're a full time writer, or someone who just wants to give writing a try, these tips should help you find more time to write. Tip #1 - Get Organized. ° Create project folders so you can easily and quickly locate whatever you are working on. ° Keep an idea notebook handy at all times, so you can jot down ideas for articles, stories, etc. whenever they come to you and you'll have them all in one, easy to find, place. ° Clean off your desk or other writing space. If it's a mess, you'll spend precious time trying to find things you need. Put pens and pencils in containers. Get file folders for loose papers you wish to keep. ° Keep reference books handy as you’re writing so you can refer to them whenever you need to. Tip #2 - Make Decisions Ahead of Your Actual Writing Time. New writers don’t seem to realize it, but the planning stage and the writing stage work best as two different stages. If you plan what you’re going to write, then it will be easier once you sit down to write it. No more wasting your precious writing time, staring at a blank page or computer screen. Tip #3 - When Writing a Nonfiction Book or a Novel, Work from an Outline. Make your outline in the planning stage of your book, then when it’s time to write you can simply work on the book, a chapter or section at a time. But you’ll know what material you wish to include in that section (because you figured that out in the planning stage) so all you’ll need to do is sit down and write it. It doesn't have to be a formal outline either. Just notes that let you know what you will be writing in each section or chapter of the book. Tip #4 - Let Go of Activities That Take Your Time but Offer You No Real Benefit in Return. You can stay really, really busy during the day without much to show for it if you aren’t careful. Checking emails, spending too much time on Facebook, Twitter, and other social media sites can eat up your writing time. And do you really need to watch all those crazy cat videos on Youtube? Tip #5 - Do Many of Your Morning Chores the Night Before. If you have a day job, take a shower the night before, lay out your clothes the night before, make your lunch the night before. Then, the next morning you can get up early and write because it won’t take but a few minutes to get ready for work. Tip #6 - Outsource as Many Activities as You Can. Once you start making money as a writer, hire a VA (virtual assistant) who can do many of your marketing chores for you. This person can also upload new content (that you write and send to him or her) to your blog, etc. If you can afford it, hire someone to clean your house once a week or pay your older kids to do it. Let your younger children fold clean laundry and put it away. They might not do a perfect job, but so what? Tip #7 - Train Your Kids to Work/Play Alongside You While You Write. If you have young children who are home with you during the day, train them to play quietly alongside you as you write. Tip #8 - Hang Out with Other Productive Writers. There are many, many people out there who say they are writers. Yet, a great percentage of these people rarely, if ever, write anything. You don’t want their bad habits rubbing off on you. Instead, find writers who write regularly and hang out with them. You’ll see how they manage to get so much writing done and you’ll begin to write more, too. Tip #9 - When people ask you what you do, don't be afraid to tell them you’re a writer. If you tell people you’re a writer, then they won’t be surprised when you tell them you need to write. They won’t expect you to drop everything and join them for lunch or a shopping trip, etc. whenever they call because they’ll know you have writing to do. Tip #10 - Set Specific Writing Goals for Each Writing Session. When you know what you wish to accomplish during each writing session, you’ll be more productive. Plus, you’ll become more confident and feel more successful because you’ll be able to see how you are meeting specific goals each session. This will help you look forward to your next writing session. You’ll also tend to write for longer periods of time, just to reach a specific writing goal. Okay, so those are just a few ways to find more time to write. Do you have other ways that work for you? If so, please share them here in the comments section. What a valuable list of ideas you have here. Thank you. One area that always seems to work for me is to set a specific word count for my writing. For example, maybe I decide to write 500 or 1000 words every day to complete a project. When I set such a specific goal, it pushes me to actually do it every day until I finish the project. 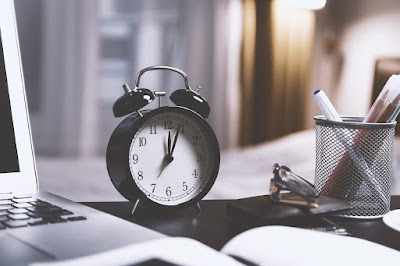 Suzanne, great list of time management tips for getting writing done. I'm serious about #2. I have a to-do list so I know what I need to be working on each day and I update it daily.